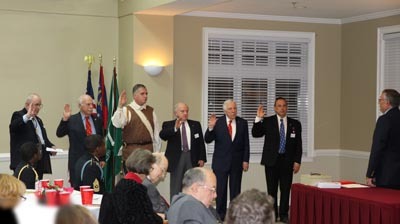 The Piedmont Chapter held it's 24th Anniversary Annual Meeting and Awards Banquet on this date at the Roswell Adult Recreational Center in Roswell GA. Members were recognized for their contributions to the Chapter in 2017, JROTC Cadets were recognized for their achievements, a Scout was recognized, and new Officers were sworn in & assumed their roles for 2018. Past Presidents were recognized including: Bill Kabel, Bill Lusk, Paul Prescott, Bob Shaw, Jim McIntire, Bob Sapp, and George Thurmond. Outgoing President Rick Reese Jr. and 2018 President Ron Redner presided over the occasion. Linda Bhame was the guest speaker for the evening. 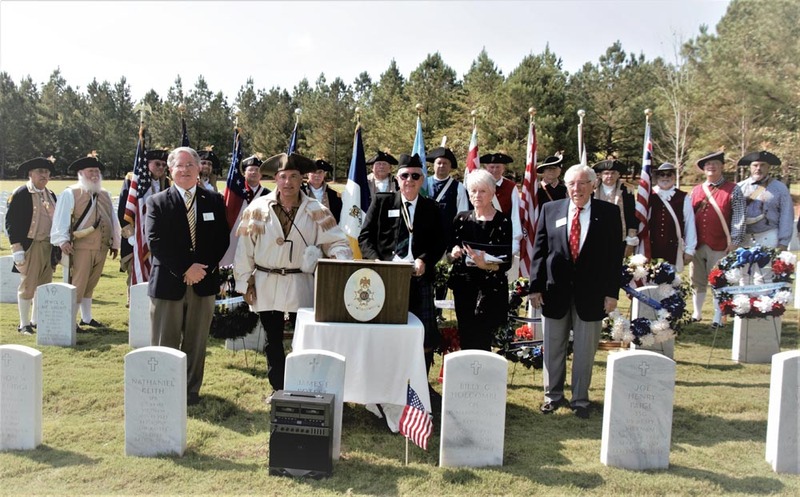 Each year, American Revolutionary War Lieutenant Colonel Elijah Clarke, nicknamed "Hero of the Hornet's Nest" is remembered with his fellow patriots in Washington, GA. NSSAR Chapters from around the Southeast, including the Piedmont Chapter, participate in a Memorial Service, Parade, a Battle Field Reenactment, and a Ceremony at War Hill. 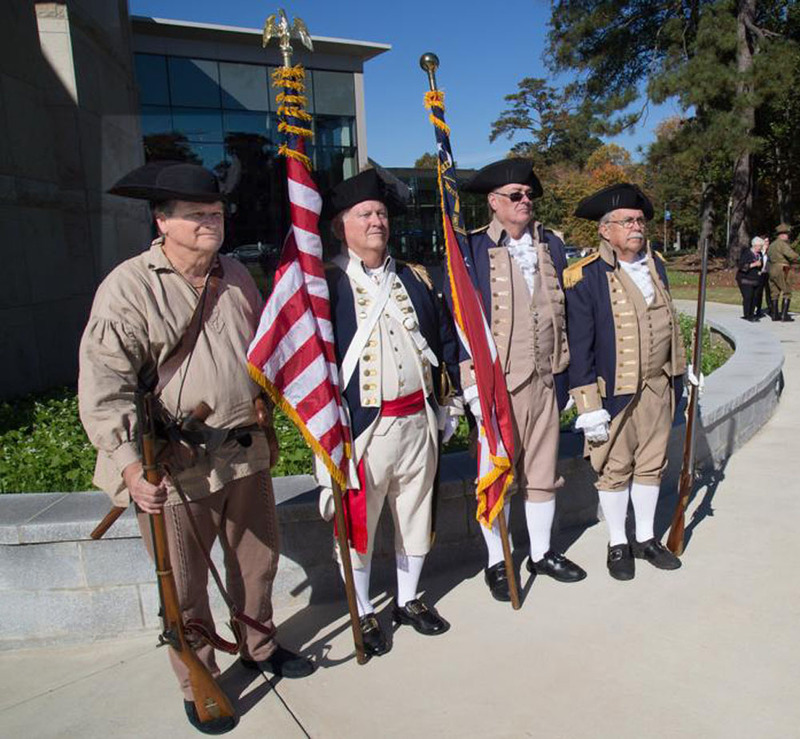 Piedmont Color Guard members George Thurmond and Bob Sapp presented the colors at the recent Vietnam War Veterans Day Ceremony hosted by the John's Creek Veterans Association. 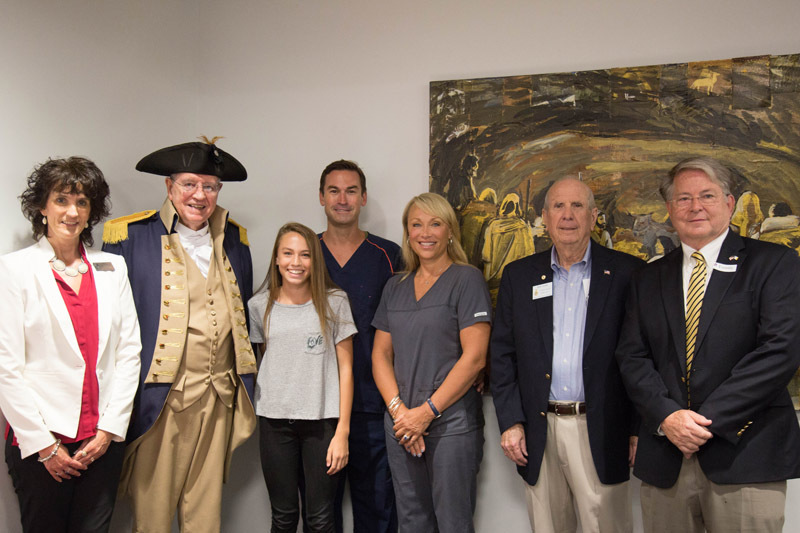 Colonel Richard White spoke at the ceremony and the JCVA recognized former Johns Creek City Council member Cori Davenport for her contributions to the organization. The event, which honors the official March 29th National Vietnam Veterans Day, and the men and women who served and sacrificed during the Vietnam War. 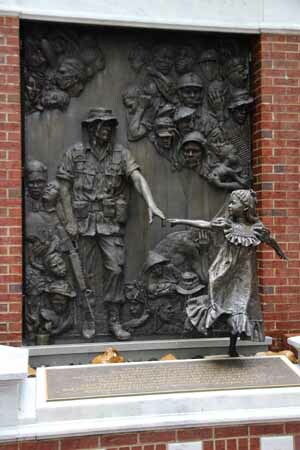 Visit the John's Creek Veterans Memorial walk off Old Alabama Rd. Piedmont Chapter Color Guard members George Thurmond and Rick Reese Jr., along with Piedmont Chapter member Jerry Breed presented awards on April 21st to middle school students at Fellowship Christian School in Roswell, GA. for the 2018 SAR Brochure Contest. The school entries were made under the encouragement of their teacher, Ms. Joan Ergle for 8th Grade Social Studies. 75 students competed for these awards. Students were encouraged through their research to exhibit knowledge and understanding of American History using any of the five "Foundational Documents" as the brochure theme which include, Articles of Confederation, the Declaration of Independence, the Constitution, the Federalist Papers, and the Bill of Rights. Each finalist received a copy of the book "Founding Fathers". 8th Grade student Grace Hargett received a first place award and received a check for $125 for her school entry along with a certificate for winning the chapter competition. Grace's brochure will now be entered in the Georgia State SAR Brochure Contest competition. Connor Wright placed 2nd, receiving a check for $25 and a certificate, Kailey Anne Breed (granddaughter of Gerald Breed) placed 3rd and received a check for $15 for her work, and Sierra Inglis and Andrew Schmidt both received a check for their entries in the contest. Honorable Mention certificates were given to Grace Morgan, Chelsea Pozatek and Ernest Carey. We congratulate Grace Hargett, 8th grade student at Fellowship Christian School for winning the Georgia SAR State competition for her Brochure entry. 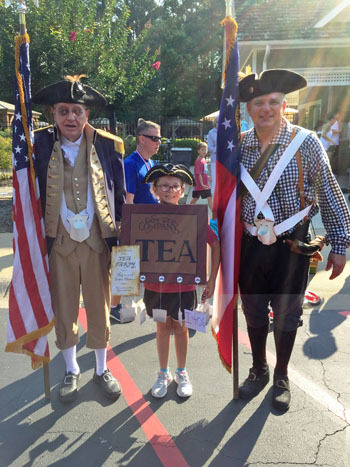 Grace's brochure on the Declaration of Independence now has been entered in the National SAR Brochure competition. Grace received a certificate and a check for $125 for her winning entry, along with an additional check for $150 and certificate for winning the state competition. Grace is the daughter of Chad and Lorie Hargett of Roswell. Her entry in the SAR Brochure contest was made with the encouragement of her 8th Grade Social Studies teacher at Fellowship Christian, Ms Joan Ergle. Pictured above are (L to R) Ms Joan Ergle, Piedmont Chapter Brochure Contest Chairman President George Thurmond, Grace Hargett, Chad and Lorie Hargett, current Georgia State SAR Treasurer Bob Shaw, and current Chapter President Ron Redner. The city of Roswell held the annual "Roswell Remembers" event on the lawn behind the Roswell City Hall to honor our former and active duty military personnel on Memorial Day, Monday 28, 2018. Despite the threat of rain, the turnout was very good. Fortunately, the rain held off until later in the day after the event had ended. The Piedmont Chapter had a tent set up where interested attendees could stop by to talk about the SAR and the traveling trunk artifacts that were on display. Piedmont Color Guard members Bob Sapp, George Thurmond, and Paul Prescott were on hand to address their questions. Those Piedmont Color Guard members plus color guard member Bill Floyd from the Mount Vernon Chapter presented the colors to open the ceremony in front of the hundreds of people in the seated audience. 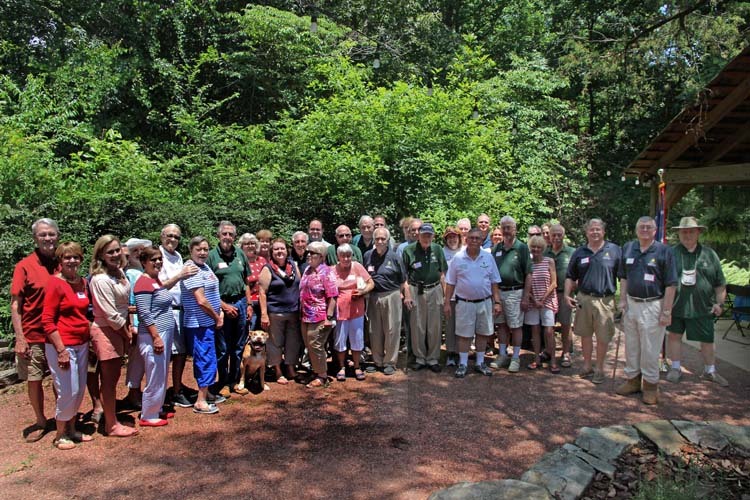 This years picnic was held on Saturday 6/16, at the Roswell Bulloch Hall pavilion. We had a good turnout with 55 people attending. 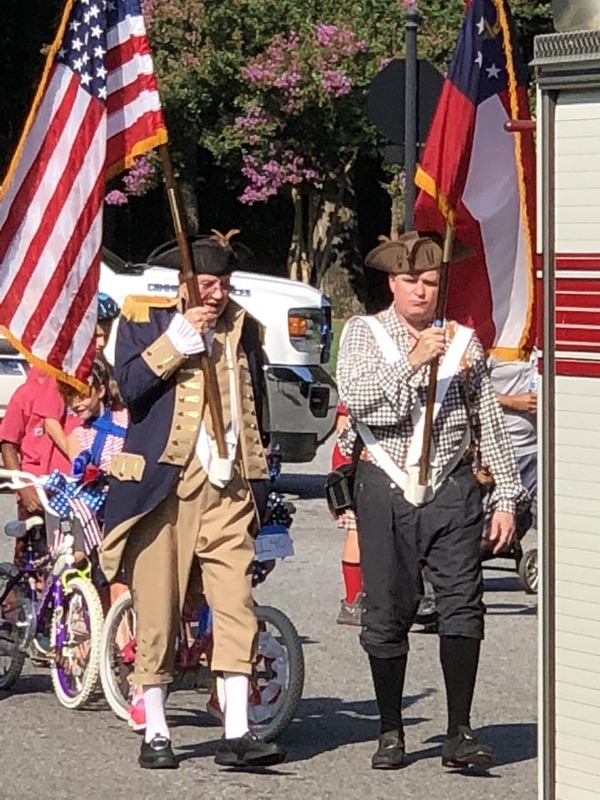 Piedmont Chapter Color Guard members George Thurmond and Jaime Ruff participated in this years John's Creek 4th of July Parade. The chapter earned 64 Americanism points by marching in the parade. Piedmont Chapter color guard members George Thurmond and Jaime Ruff led this years Windward Community 4th of July Children's Parade. Piedmont Chapter SAR member Robert A. (Bob) Sapp was recently honored at the SAR's 128th Annual Congress in Houston, Texas with the prestigious Minuteman Award. 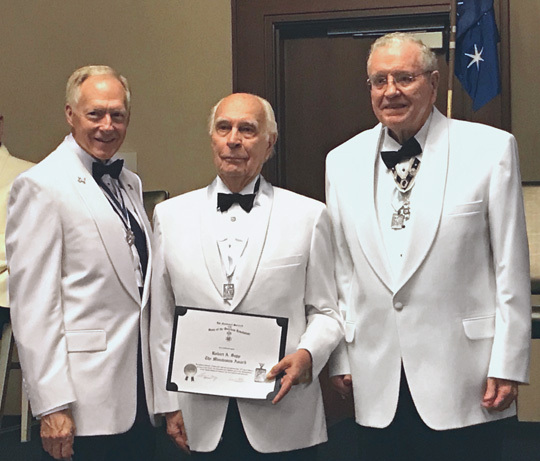 Bob was aware in the spring of his award, then 2017-2018 SAR President General Larry Guzy presented the award to him at this years annual Congress. 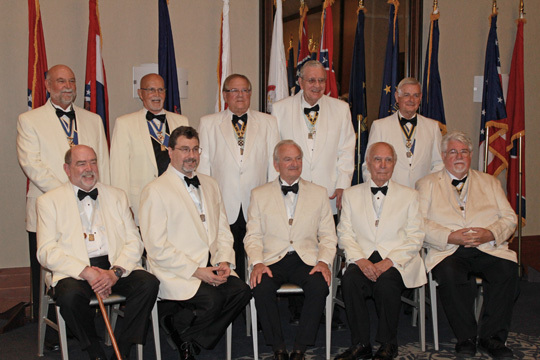 Front Row (All new recipients): (l-r) Ed Rigel, Sr., Dour Collins (KY), Martin Boyer (France Society), Bob Sapp, John Sinks (DC). Back Row: Michael Tomme, Lindsey Brock, David Appleby, George Thurmond, Nathan White (TX). All are Past President Generals's except George Thurmond. One was missing from the Annual Congress - David Billings (AL). George Thurmond received his Minuteman Award & medal in 2008 and Larry Guzy received his in 2006. The Roswell and Milton City Councils both issued a Proclamation in recognition of Constitution Week on September 17th through September 22nd. Mayor Lori Henry issued a Proclamation for Roswell and Mayor Joe Lockwood issued a Proclamation for Milton. 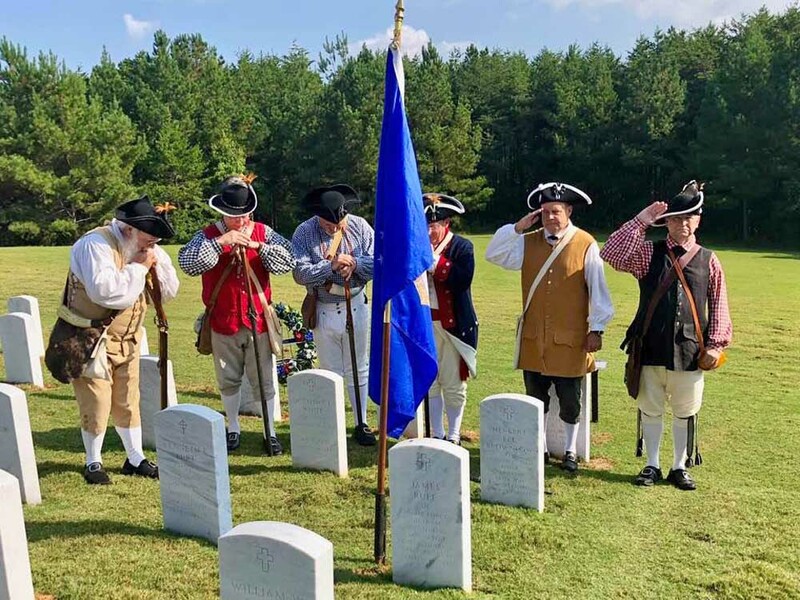 Invited were members of the Piedmont Chapter of the Sons of American Revolution (SAR), the Martha Stuart Bulloch Chapter of the Daughters of the American Revolution (DAR) and the Martha Stewart Bulloch Chapter of the Children of the American Revolution (C.A.R.). Uniformed Color Guard members of the Piedmont Chapter opened the meeting by leading the Pledge of Allegiance. George Thurmond, Bob Sapp, Rick Reese Jr., and Paul Prescott made up the Color Guard unit. Both events at Roswell City Hall and at Milton City Hall were published by the Alpharetta Patch. The Service was held at the Georgia National Cemetery, near Canton, GA. His Grave Marker was presented by the Gwinnett Chapter of the SAR. 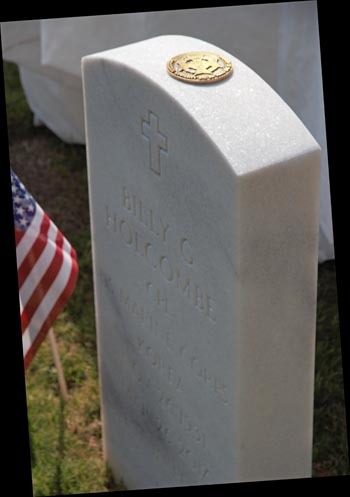 A Grave Marker was presented by the Piedmont Chapter of the SAR for member Billy Gene Holcomb who passed away in March of 2017. The ceremony was held at his grave at the Georgia National Cemetery. 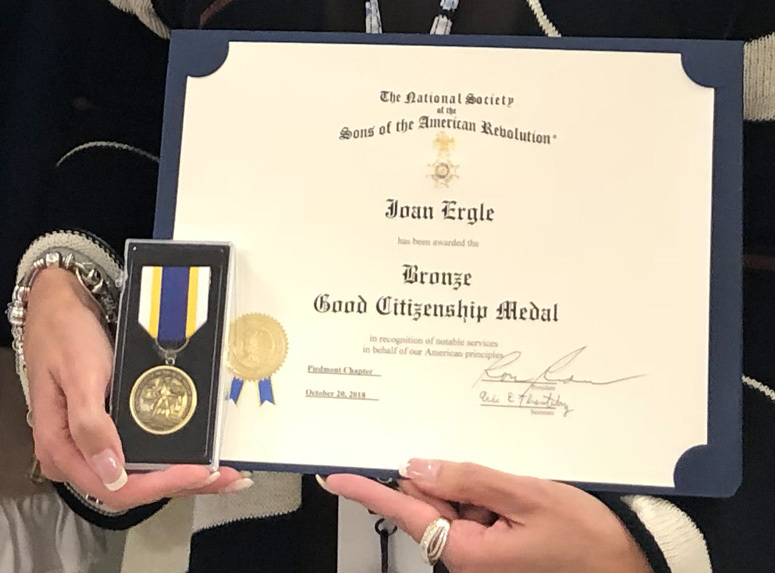 The Piedmont Chapter honors and congratulates 8th Grade Social Studies teacher Ms Joan Ergle at Fellowship Christian School in Roswell, GA. She was presented with a SAR Bronze Good Citizenship Medal for her continued support of the Piedmont Chapter and the SAR by sponsoring the Sgt Moses Brochure Contest in her classes over the past four years. The local, state and national SAR Brochure contest is focused on 6th, 7th or 8th grade Middle School level students. The contest promotes knowledge of the American Revolutionary War by rewarding students with cash prizes for the most creative, accurate and visually appealing brochures on a designated theme. During this four year time of guidance by Ms. Ergel, Fellowship Christian School entries finished 2nd and 3rd place nationally at the annual SAR Conventions. 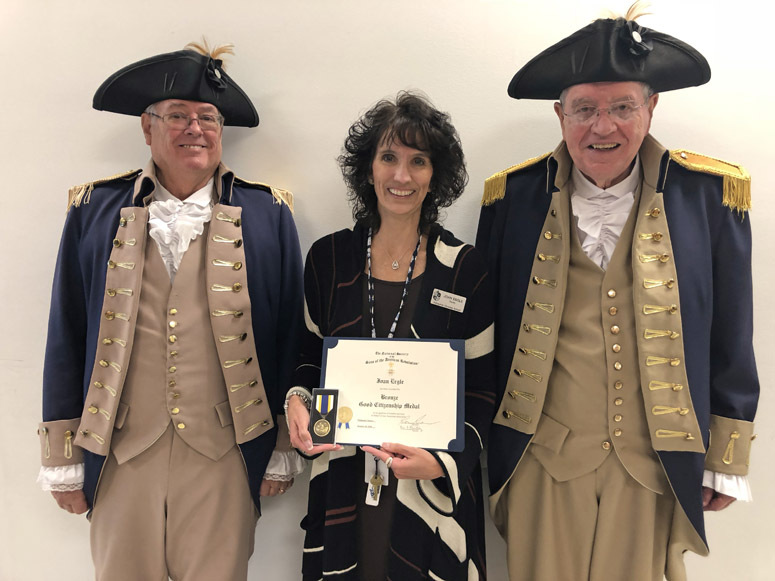 Ms Ergle was entered in the Dr. Tom & Betty Lawrence American History Teacher contest, competing with other teachers around the country. She has a good chance of doing well. Congratulations! Go Paladins! Piedmont Chapter Brochure Contest Chairman George Thurmond. The Georgia Color Guard presented colors at the Annual Veterans Day Ceremony on Sunday 11/11 at the Atlanta History Center. That day was established to commemorate the end of WWI, when that war ended on the "11th hour of the 11th day of the 11th month". The annual Veterans Day program at Veterans Park featured a keynote speech by Joe Galloway, one of America's premiere war correspondents and co-author of the international bestseller We Were Soldiers Once... And Young, which was adapted into the acclaimed movie We Were Soldiers. The GSSAR Color guard was proud to be a part of a very special Day. Rick Reece Jr. (Piedmont), and Shep Hammack (Mt. Vernon).